All engineering student especially mechanical engineering had gone through the word Diesel Engine. These people might better know the working principle of a diesel engine as well as a car engine. If you don’t have bachelor’s degree in mechanical engineering still you can easily understand the working of an internal combustion engine. You just have to read the full article. A diesel engine is widely used in automotive industry, auto industry, and car manufacturers. It can also be used in diesel generator and on ships. Nowadays agriculture pump is also run by small diesel engine. If you are a diesel mechanic or wish to be a diesel service technicians and mechanic, this post is for you. I will like to share details in very simple manner hence you will better understand the working of the engine. In a diesel engine, diesel oil, light, and heavy oil are used as fuel. This fuel is ignited by being injected into the engine cylinder containing air compressed to a very high pressure. The temperature of this compressed air is sufficiently high to ignite the fuel. Hence there is no spark plug used in the diesel engine. This high-temperature compressed air used in the form of very fine spray is injected at a controlled rate. So, that the combustion of fuel proceeds at constant pressure. Fuel Injector or fuel injection pump, fuel atomizer is used for this operation. The power is generated by completing working stroke. In this stroke, the piston moves down from the top dead centre towards the bottom dead centre. As a result, inlet valve opens and the air is drawn into the cylinder. After sufficient quantity of air with pressure is drawn, a suction valve closes at the end of the stroke. The exhaust valve remains closed during this stroke. In this stroke, the piston moves up from bottom dead centre to top dead centre. 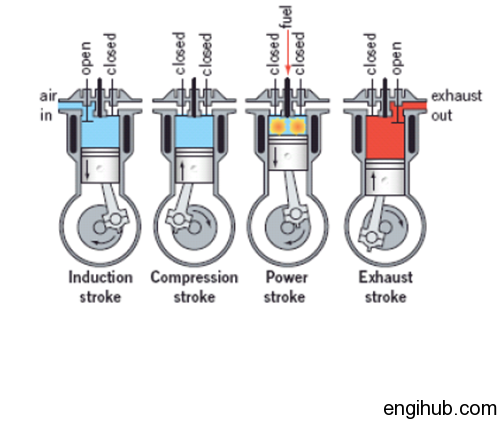 During this stroke, both inlet and exhaust valves are closed. The air drawn into the cylinder during suction stroke is entrapped inside the cylinder and compressed due to upward movement of the piston. In a diesel engine, the compression ratio used is very high as a result, the air is finally compressed to a very high-pressure up-to 40 Kg/cm², at this pressure, and the temperature of the air is reached to 1000° centigrade which is enough to ignite the fuel. In this stroke, the fuel is injected into the hot compressed air where it starts burning, at constant pressure. When the piston moves to its top dead centre, the supply of fuel is cut off. 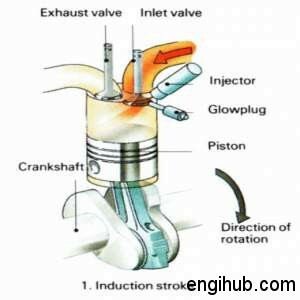 It is to be said that the fuel is injected at the end of the compression stroke and injection continues until the point of cut-off, but in actual practice, the ignition starts before the end of the compression stroke to take care of ignition tag. In this stroke, both inlet and exhaust valve remain closed. 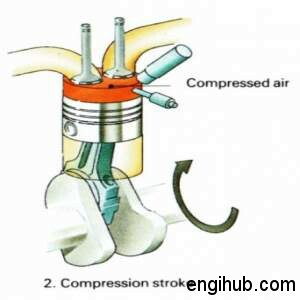 The hot gases (which are produced due to ignition of fuel during compression stroke) and compressed air now expand adiabatically, in the cylinder pushing the piston down and hence work is done. At the end of a stroke, the piston finally reaches the bottom dead centre. In this stroke, the piston again moves upward. The exhaust valve opens, while inlet and fuel valve is closed. A greater part of the burnt fuel gases escapes due to their own expansion. The upward movement of the piston pushes the remaining gases out through the open exhaust valve. Only a small quantity of exhaust gases stay in the combustion chamber. 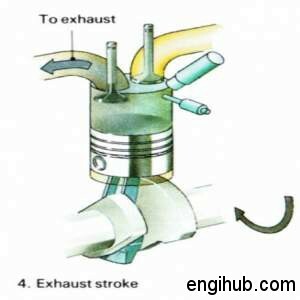 At the end of an exhaust stroke, the exhaust valve closes and the cycle is thus completed. As there is some resistance while operating in inlet and exhaust valve and some portion of burnt gases remains inside the cylinder during the cycle, resulting in the pumping losses. These pumping losses are treated as negative work and therefore subtracted from actual work done during the cycle. This will give us network done from the cycle. 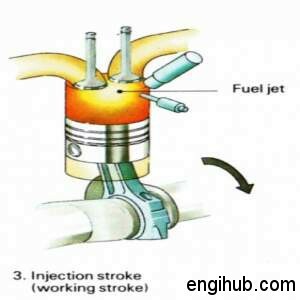 Actually, all these strokes are performed at such a fast speed; you cannot see it step by step but it happens in every four stroke engine.